A driver using a cell phone while driving. In our personal injury practice here at Cramer & Anderson, we have noted a marked increase in clients injured as the result of wrong-lane and head-on collisions over the last few years. A significant number of our injured clients in such cases have reported during intake interviews either confirmed or suspected cell phone usage by the at-fault driver. This is not an aberration. According to the National Highway Traffic Safety Administration (NHTSA), traffic operators using mobile phones while driving are four times more likely to become involved in a serious enough collision to cause severe injury or death. And although many states have enacted legislation permitting hands-free usage, NHTSA studies reveal that both hand-held and hands-free cell phone usage impairs driving ability. This is because the concentration required for device usage is enough to divert attention from vehicle operation. 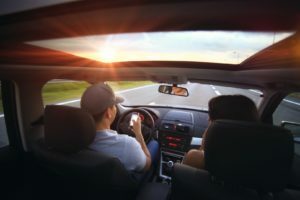 During the daylight hours, the NHTSA estimates that over 800,000 vehicles at any time in the U.S. are being operated by someone using a cell phone. During a typical drive trip of 10 miles, drivers are continually called on to make decisions and adapt to conditions that require the brain to recognize, assess and react. Most of these decisions are quite natural and are made somewhat reflexively. But drifting across the center line or reacting to a bicyclist or roadside hazard while concentrating on a phone call can require too much processing and result in the failure to recognize potentially dangerous situations. When one adds the absurdity of text-messaging to the equation, the potential for serious consequences is obvious. There is good reason that text messaging while driving is prohibited in 47 states. It is nearly impossible to safely text and drive. Period. We hope none of our readers suffers the consequences of this potentially lethal, modern day hazard. Accordingly we suggest that automatic “I’m driving” messages be transmitted to callers. If you must send or receive a text, there is no text message so urgent or important that you cannot pull off to a safe place to do so. As far as verbal usage, we suggest that if one must use the phone, do so with a hands free device using verbal commands set up prior to embarking, keep conversations short and only do so when necessary. We hope you remain safe. 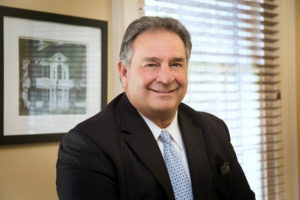 Attorney D. Randall DiBella’s Practice Areas include Personal Injury, Civil Litigation, Municipal Law, and Land Use & Environmental Law. 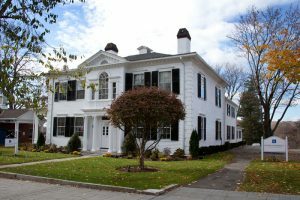 He works primarily in Cramer & Anderson’s flagship office in New Milford and lives in Litchfield. Attorney DiBella may be contacted by phone at (860) 355-2631 or by email at drdibella@crameranderson.com.